We are constantly seeing new faces show up. So, bring them all: kids, grandchildren, nieces and nephews. You are the best mentor and example for our Indian children. 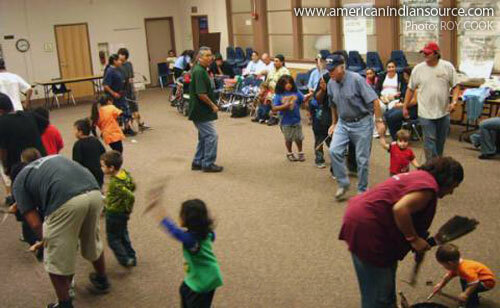 Here is a view of our last class that shows, hand in hand, gramps and kids. All our relations are welcome at this intertribal Soaring Eagle dance class and regalia gathering. 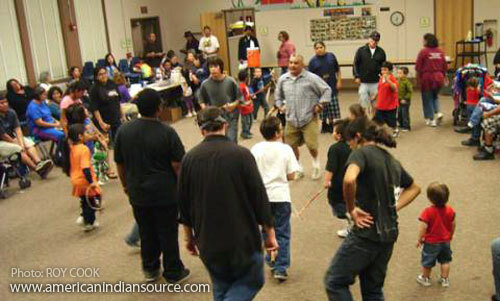 Harvest time and November are very busy months for Native American events and activities. These winter months bring seasonal colds and illness that is more serious too. Vickie Gambala is out with pneumonia. The Soaring Eagle program continues this Fall 2009 on Tuesday at 6:30 pm at the Ballard Parent Center in Old Town. The best access to parking is from Jefferson St. The SCAIR sponsored and community potluck continues to be very popular. Tonight is good comfort food and a real crowd pleaser: Chilaquias, Spanish rice, beans and potato salad. Three Happy Birthdays to celebrate with song and cake. It goes very good with the Hot Coffee and the punch is always welcome. This potluck is largely due to the dedication of all the community to bring in something to share. Chuck Cadotte is able to provide individual instruction and encouragement to each group as he calls for the appropriate song for the dance category of the moment. 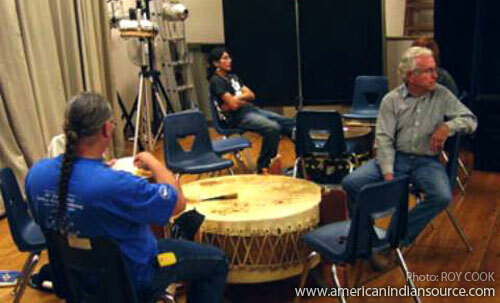 New drum at the center lifted its voice with the two others for the benefit of the dancers. This evening we had another opportunity to enjoy some very spirited songs and appreciate sharing the stage with gentle instruction. All will be good if we keep our perspective to help the dancers learn our Indian ways. This evening there are many announcements, corrections and opportunities. November 6 at UCSD our Soaring Eagle San Diego Unified District Title VII coordinator Vickie Gambala will be honored at the mini-pow wow. This is scheduled on Friday from 6-8 pm in the Multi-purpose facility on the UCSD campus. November 10 at Old Town Ballard center 6 pm to 8:30 there is a Veterans event scheduled and pot luck dinner. The Soaring Eagles will dance and Steve Garcia will perform a special tribute for the occasion. November 10 or 13 Native American Month at San Diego City Hall civic center plaza from 11am to 1pm. Soaring Eagles will dance by invitation of SD Councilman Todd Gloria. Nov. 12 at SDSU Scripps cottage 5pm Inter-tribal singers, AIWA, dancers welcome. NASA Dinner for all at 7pm. November 14 Soaring Eagle dance exhibition at the Bonita library. Performance at noon is there in regalia by 11am.